I asked the question, "Do you remember what it was like to be a slave in Egypt?"... (awkward pause)... they responded, "What are you talking about?" "When you are harvesting in your field and you overlook a sheaf, do not go back to get it. Leave it for the alien, the fatherless and the widow, so that the LORD your God may bless you in all the work of your hands. When you beat the olives from your trees, do not go over the branches a second time. Leave what remains for the alien, the fatherless and the widow. When you harvest the grapes in your vineyard, do not go over the vines again. Leave what remains for the alien, the fatherless and the widow." Notice a pattern in the text? ..."for the alien, the fatherless and the widow"... and then it brilliantly closes the chapter with this statement of purpose: "Remember that you were slaves in Egypt. That is why I command you to do this." Do you remember Egypt? This law or "warning", as Rob Bell puts it (in Nooma: Corner coming in May 2009), is not just for the poor and for the needy but for the owners of the crops and the olive trees--it's for the rich, that they may remember and not forget what it was like to be a slave in Egypt. God is saving them from indifference. God does not want them to become the abused who become abusers, as is the pattern of the world (this is actually almost a quote from a modern day Israeli reporter commenting on Israel's mistreatment of the Palestinians, he called Israel the "abused child who had become the abuser"). Do the Pharisees remember what it's like to be slaves in Egypt? Their response to seeing Jesus and his disciples, so hungry that they are taking those sheaves which have been reserved for the poor, is telling. They say "Look, why are they doing what is unlawful on the Sabbath?" did they forget what's really important? Did they forget Egypt? Jesus elevates the conversation by illustrating what they're really arguing about. Jesus says, "Do you remember?" He asks them, "Have you never read what David did when he and his companions were hungry and in need?" when David came into the house of God in 1 Samuel 21:1-6 he was apparently hungry and in need. At that point he took sacred bread and ate it, bread that should have been reserved for special people went to the hungry. 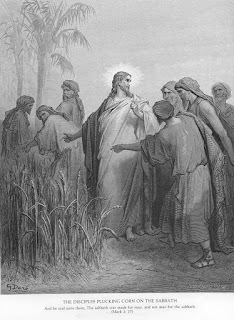 it makes sense for Jesus to site this story for the Pharisees, not only because they may have seen themselves as special people, but because the real question at hand concerns what truly is and what to with with sacred stuff. The sheaves are sacred in a way, made sacred and untouchable because the day on which the disciples arrive upon them is sacred. Of course the Pharisees could have fed them, they never traveled too far from their food (according to the IVP Bible Background Commentary:New Testament, page 142). When David took the bread, hunger and need became more sacred than consecrated bread and priests. Jesus then responds with the great phrase "The Sabbath was made for man, not man for the Sabbath." This is a commentary on the whole law. People are the purpose of the law, of the Way of God. Love of people is the true litmus test of righteousness, not adherence to ritual law. It's a matter of selfishness. Because of their short memories the Pharisees had become more concerned with looking obedient than with loving their neighbors. After long enough it had began to make sense for them to worry about petty rules and regulations. The preservation of their power and theology became sacred over the lives of individuals and it made sense for them to worry about defending those things. It began to make sense to worry about other things. They forgot what it was like to be a slave in Egypt. They forgot that all these rules and all this theology was really there for the good of people... especially the poor, the widow, the orphan, and the immigrant. They forgot to do things for the sake of healing the world (Tikkun Olam) not just for the sake of following the rules. They forgot what it was like to be hungry and in need, for if it were their hunger and need they would have remembered that the sabbath was made for people not people for the sabbath. They would have remembered that human life is more sacred than any theological truth, and in fact that theological truth is at the service of the hungry and the needy. Do you remember what it was like to be a slave in Egypt? How much of our problems come from not remembering that place? God wants to save you from indifference and from Pharisaic misery. God, give us a memory of that place which perhaps we have never been.